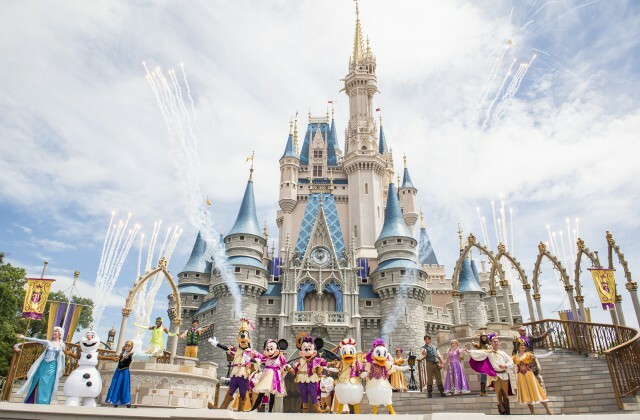 “In ‘Mickey’s Royal Friendship Faire,’ 15 Disney characters from different stories come together to showcase how diversity and the discoveries you make through friendships shape who you are,” said Show Director, Walt Disney World Entertainment, Tara Anderson. From the land of the bewitching bayous, Goofy has invited Princess Tiana and Prince Naveen to add a little spice of New Orleans jazz to the party. Donald Duck brings some new friends he met in the land of the enchanted woods, where Daisy Duck introduces us to her special guests, Rapunzel and Flynn. Finally, Mickey Mouse shares a surprise with Minnie Mouse, as he has traveled to the land of the mystic mountains to invite Olaf, Princess Anna, and Queen Elsa, who swirls a blast of her icy magic. The celebration culminates in a grand dance, marked by a magical daytime fireworks finale. “Mickey’s Royal Friendship Faire” is presented daily at 10:30a.m., 11:35a.m., 1:05p.m., 2:05p.m., 4:15p.m. and 5:15p.m.